"Weavings" by Ellen Elmes, Class of 1969. Photo by Jullienne Kay. McDaniel is all about their students, and Hoover Library is no exception. The library has received artwork from alumni who wish to leave something behind at the school that shaped them into who they are today. An example of this is the acrylic paint mural by Ellen Elmes, a 1969 graduate, which prompted the new student special collection. 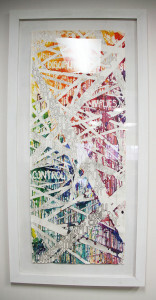 “Control Implies Discipline” by Kira Young, Class of 2013. Photo by Jullienne Kay. Along with the students’ work, there is the Mathews Collection, a collection of fine art including pieces from Turner, Daumier, and Picasso. There is also the Joe Brown Collection, a collection of athletic sculptures that are displayed on the second floor in the rotunda. The Meyers Collection can be found in front of the board room and includes Egyptian, Greek & Roman and Native American art. Finally, the Death Mask Collection, which has over 60 masks of prominent figures in European and American history, is in display on the second floor. “2.0” by Juliana Ottomano, Class of 2016. Photo by Jullienne Kay. Since 2012, Director of Hoover Library Jessame Ferguson has been actively commissioning senior art work to be displayed in the building. 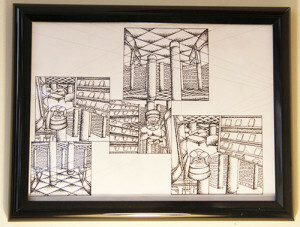 During meetings with students about the renovation project, a common theme was to ask for more artwork; that is when the Special Collection of Student Art was created. Andrea J. Briggs became the Archivist and Special Collections Librarian in 2015. She has taken over the selection, coordination, and organization of all the special collections within the library since September of 2015. Once a consensus is reached, the library buys the piece of artwork with their gift budget, an account of donations, and then proceeds to mount it with the help of Gallery Director Steve Pearsons. “Pamilya Diptych” by Julia Celebrado-Royer, Class of 2014. Photo by Jullienne Kay. 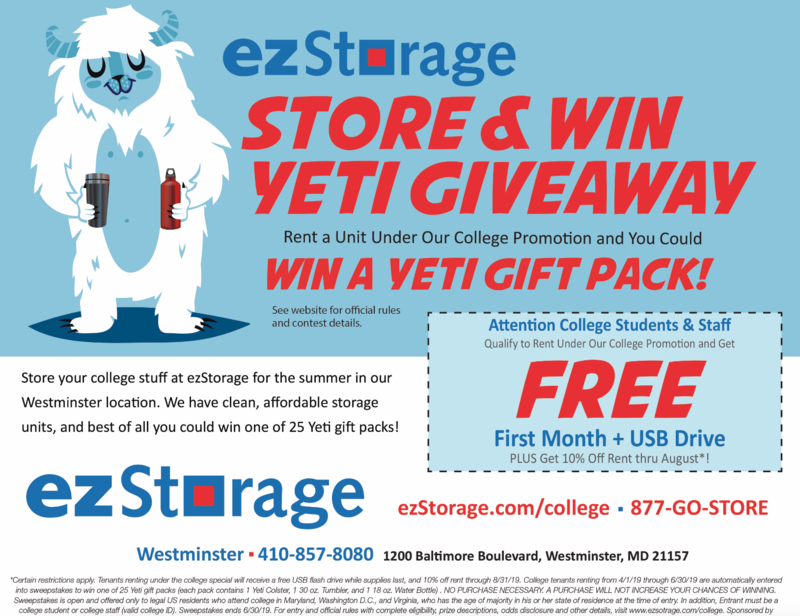 The Student Collection can be found throughout the library. 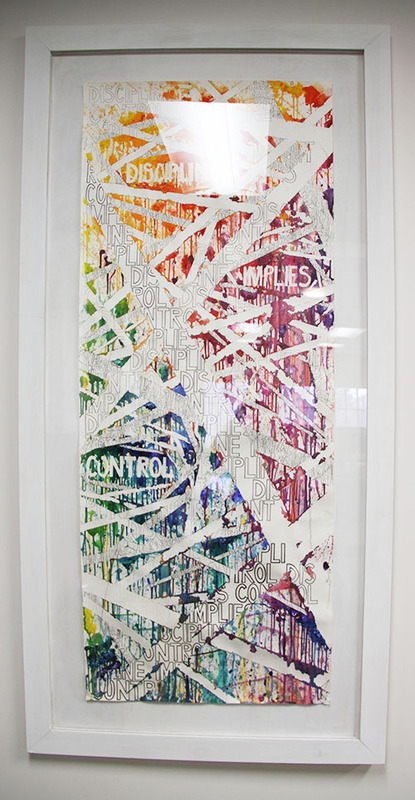 On the first floor in the commons area hangs Kira Young’s “Control Implies Discipline.” The 2013 graduate wanted to look within herself to find what she’s ‘chained to’ and thus she gives examples like “attaining the ideal body image, an overflowing bank account, or a status of great power within the workplace”. 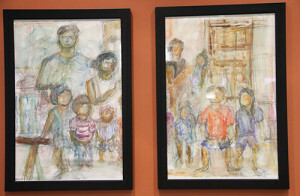 The following year, Julia Celebrado-Royer’s “Pamilya Diptych” now resides on the second floor by the main stairs. She used watercolors to show the imperfections of people’s childhood memories while still showing their importance and how they guide as adults. Last year, two pieces of art were picked due to the exceptional work done by both students. 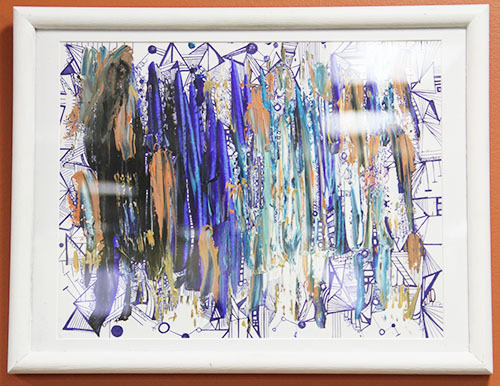 Senior Juliana Ottomano created “2.0,” an acrylic piece to express her anxiety, something many students deal with, and many of the library staff connected with her intentions and the overall beauty of the work. Ottomano’s piece can be found in the first floor commons. “Library Abstract” by Rachel Getz, Class of 2019. Photo by Jullienne Kay. These pieces of art are made by students and are for the students’ enjoyment. Briggs talks about the overall goal of this collection by saying she wants to display what the students want to see and what inspires them. 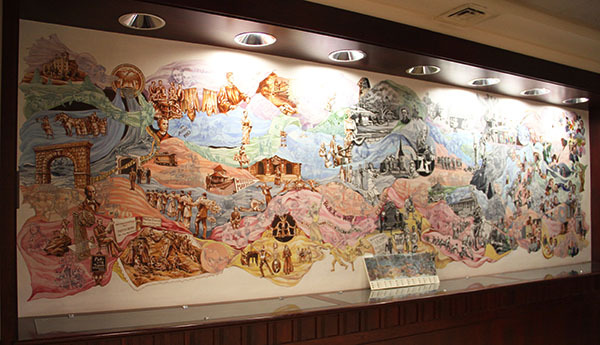 There are plenty of pieces of art within the library that tell a story, express a feeling everyone has once in awhile, and connect us no matter the usual boundaries. So take a break from studying for finals this week and take a quick look around Hoover and experience what your fellow students have created.